No homeowner wants to deal with a disgusting problem like a backed up sewer line, but unfortunately, they’re quite common. A clog in your sewer line can lead to disaster and cost thousands of dollars to repair. Since your sewer line plays a vital role in safely removing hazardous waste from your home, it’s important to contact a plumber immediately if you’re having trouble with your home’s sewer line. At G.T. Campbell, we proudly offer Macedon sewer cleaning services, and we’re here to get your line up and running again in no time. Several things can cause sewer clogs. Grease, tree roots, and foreign objects can all cause nasty blockages that keep raw sewage from being diverted from your home properly. In severe cases, the obstruction can even cause sewage to back up into your home’s crawl space or basement, resulting in a disgusting mess and a serious health hazard. Whether you’re noticing that your toilets or drains are running slower than usual or you’re dealing with a complete blockage, it’s important to contact a certified plumber immediately. 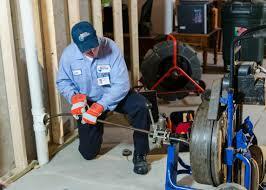 When you contact us regarding your sewer line problems, we’ll dispatch a plumber right away. A sewage backup is an emergency situation that requires prompt attention, and you can count on us to take care of the problem quickly and correctly. We employ a safe and effective sewer cleaning technique that will clear the damage without damaging your sewer line. We can break up even the most stubborn clogs in minutes. When you’re in need of sewer cleaning in Macedon NY, count on the experts right here at G.T. Campbell Plumbing. We can take care of any clog and get your sewer line flowing freely again in no time. For expert sewer cleaning in Macedon, call your trusted plumber.